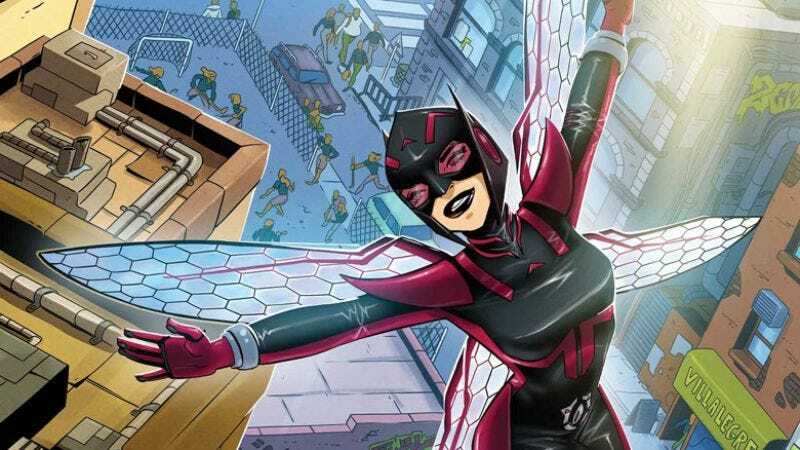 Nadia Pym is Marvel’s latest attempt to make its comic-book universe resemble its cinematic universe, and while she’s not exactly the same character as Ant-Man’s Hope Pym, she fills the same role as Henry Pym’s daughter that takes on the Wasp mantle. (In Slavic, Nadia means hope.) Nadia takes the spotlight in the new The Unstoppable Wasp (Marvel) ongoing series, which has her creating the Genius In Action Research Labs (G.I.R.L. ), dedicated to finding brilliant young women and giving them the opportunities and resources to further their education and explore their natural talent. Written by Jeremy Whitley with art by Elsa Charretier and colorist Megan Wilson, The Unstoppable Wasp is a book full of good intentions: It focuses on bringing girls into the male-dominated STEM field (including backmatter interviews with real-life female STEM professionals), features a cast of characters from different ethnic backgrounds, and prioritizes fun and compassion in its storytelling. The artwork from Charretier and Wilson is dynamic, expressive, and bright, with imaginative layouts and detailed linework, particularly when it comes to the messy science lab environments. Charretier has quickly risen through the ranks of comic artist with her animated, effervescent style, and she’s the perfect artist to handle a story about a joyful new superhero. Nadia is overwhelmingly sunny and optimistic, but it can read as saccharine at times. The first issue has multiple instances of people getting weepy when they meet Nadia because her positivity is so inspiring, but these emotional moments are forced. The implication is that Nadia’s endless joy melts the hearts of everyone around her and turns them into big softies, but it also makes the characterizations feel flat and strips away the conflict in her interactions with others. In general, the lack of conflict is what’s holding this book back. The end of The Unstoppable Wasp #2 introduces some tension in the form of a familiar face from Nadia’s past returning to her life, but hopefully future issues will explore Nadia’s experience in the Red Room and how her current disposition relates to that past trauma. The Unstoppable Wasp #2 delves deeper into why Nadia is committed to finding young female scientists, drawing attention to the fact that the field of super-science in the Marvel Universe is 75 to 90 percent male. The historical reason for this is because the writers of the Marvel Universe have been majority male, and the gender disparity highlighted by this series draws extra attention to the fact that this is another female superhero book written by a man. Whitley has built his comics career on writing stories that empower female characters, specifically in his creator-owned Princeless series, but it would be nice to see Nadia’s pay-it-forward attitude reflected in the creative team by bringing on a woman as co-writer. The concept is Whitley’s idea and he should be in charge of bringing it to the page, but there are so many exciting female talents in the comics industry that aren’t getting the exposure of working on a Big Two superhero book. The world needs more funny comics, and it especially needs more funny comics that tackle serious subjects. The trend toward dark themes and darker humor only serves to punctuate how bad everything is. This isn’t to say that there’s no place for morbid jokes and serious stories, but it does leave a large gap in the kind of books that are available to readers, not to mention limits the age range those books are appropriate for. Ladycastle #1 (Boom! Studios) walks back and forth between jokes and social commentary with far more grace than most other comics. The book begins with a princess trapped in a tower, but this is not simply a retelling of Rapunzel. Aeve was imprisoned by her own father in a bid to keep her safe and “pure” while he searches for a suitable husband. She isn’t completely isolated from the rest of the world—her tower is in the center of a castle fully populated by women. When her father left her behind in pursuit of the perfect son-in-law, he took all of the men with him, leaving their wives and sisters and daughters to take their place as barbers, bakers, and blacksmiths. The women soon discover that all of their men are gone, presumed dead, and struggle with what to do next. Where Ladycastle sets itself apart from similar comics is with the humor. It’s full of Easter eggs and little jokes, everything from a riff on Beauty And The Beast lyrics to the myth of the Lady Of The Lake. Nothing is sacred, but rather than diminishing the importance of what the characters are facing, the jokes serve to highlight how screwed up everything is and how hard they’ll all have to work to fix it. It’s Rapunzel meets Y: The Last Man, through the lens of Monty Python And The Holy Grail. Writer Delilah S. Dawson is well known for her sci-fi and fantasy books, and this is a strong, well crafted first comic. There are moments where the plot jumps, a common problem for first-time comic writers, but the arc of the issue is solid. It’s her perspective that makes Ladycastle so different from Another Castle, which shares many similar tropes. By completely removing men from the story, there’s no opportunity to slide into focusing on them or removing the agency of the female characters. Aeve, her little sister Gwyneff, and the blacksmith’s wife Merinor are clearly at the center of this story and there’s no chance of them being pushed aside. DC’s Rebirth initiative has been going strong for the better part of a year—since June of 2016—and it has succeeded in many of its goals. Sales are up, buzz is good, and people are generally confident in the company’s direction, certainly more than in a very long time. That Rebirth just happened to coincide with a talent implosion at Marvel is pure coincidence, most likely, although DC poaching a few of Marvel’s best rising talents certainly didn’t help. With Marvel bogged down in unpopular directions for many of its flagship franchises, DC’s movement back to basics was well timed. It can’t help but look better simply by virtue of not having published Civil War II. The best way to take DC’s temperature at any given moment is through Batman, not merely the company’s de facto flagship but the industry’s as well. (Diamond still indexes its sales charts in percentages relative to the sales of Batman on any given month.) Tom King is perhaps the most famous Marvel defector brought on board for Rebirth: after reinventing the notoriously difficult Vision (a book that sold poorly but which will enjoy a long life in collection), he could probably have written his own ticket at the company. But instead he decamped for DC, where he recently finished his similarly poor-selling but also similarly critically acclaimed Omega Men revamp. King is currently writing Batman, which was probably by itself enough to entice him. The biweekly schedule of the most popular Rebirth books means multiple artists, and for Batman #16 King is joined by fellow Marvel alum David Finch (although Finch had been at DC for a few years prior to Rebirth). Batman is one of the few books to not see a sales increase from Rebirth. This is not because of any shortcoming in the book itself, but because the relaunch comes on the heels of Scott Snyder and Greg Capullo’s run, one of the best and most consistent books of the New 52 (perhaps damning by faint praise). King has a good feel for the character, although his emphases are different than Snyder’s. King is less concerned in crafting epic Batman stories—a tendency that marred passages of Snyder’s run—than simply telling stories about Batman as a superhero, a surprisingly fresh take on a character often bogged down by self-importance. King’s Batman has long-gestating subplots and romance and humor, things often missing or seen sparingly in proximity to the Dark Knight. His relationship with Catwoman, which continues for a few pages here, is surprisingly candid and unexpectedly intimate without being overly gratuitous (more than can be said for the New 52’s version of the relationship). Over the last few years, English re-releases of books like Gyo and Uzumaki have allowed Junji Ito to cultivate a reputation as a master of horror among a new generation of manga readers. And, for the most part, this reputation is rightfully earned. His visual concern with body horror and his Lovecraftian stories of people driven mad with obsession distinguishes his work, and the excellence of his draftsmanship and cartooning put him head and shoulders above most of his peers. But since his return to horror comics just a few years ago, his talents have been noticeably and considerably diminished by his nearly 10 year break from the genre. Dissolving Classroom (Vertical Inc.) is one such example of a weakened Ito, and while it offers many of the more generic elements of his oeuvre, it lacks much of the punch that makes that earlier work so haunting. Here, a girl with a demonic tongue harasses and frightens townspeople and her brother profusely apologizes for her. Each person the boy apologizes to is eventually reduced to a pile of goop, and, over the course of a number of stories, Dissolving Classroom follows the pair as they move from town to town. Ito derives much of the stories’ horror from the upsetting sight of people’s brains leaking out of their eyes and nose, but he leans on these images like a crutch. Each story feels selfsame, and there is very little to distinguish them aside from the faces and names of different victims. Unlike in his more meritorious shorts, such as the truly mesmerizing “Enigma Of Amigara Fault,” Ito relies exclusively on gross-out images and jump scares. In other series, like the already mentioned Uzumaki, Ito successfully builds tension slowly over a number of pages and releases it at much the same pace. The fright is not a cathartic shriek, but an almost affectless presentation of the most unnerving images—a tension that unwinds as slowly as it’s been tightened. He distends and renders the body in unnatural ways, but it is the matter-of-fact tone with which we experience those bodies that truly scares. Not so in the stories collected in Dissolving Classroom; like in his recent Fragments Of Horror, Ito reduces himself to rote and cheap maneuvering, imitating his own early work the way Neill Blomkamp imitates Michael Bay (and with an identical level of success).